Bitcoin appears on track to snap its six-month losing streak and close February in the green for the fifth consecutive year. BTC may remain better bid in March, as the weekly chart is signaling bearish exhaustion. The short-term outlook remains bullish, with BTC holding above $3,714 and a bounce from 10-candle MA on the three-day chart could yield a move toward $4,000. On the downside, a UTC close below $3,714 would validate a bearish outside reversal candle seen in the three-day chart and open the doors to levels below $3,400. The outlook as per the monthly chart remains bearish, as moving average studies are still trending south. The bearish setup would be invalidated if and when prices clear the resistance of the trendline falling from December 2017 highs, currently at $5,000. Bitcoin (BTC) looks set to end its record six-month losing streak with modest gains in February. The crypto market leader is currently trading at $3,800 on Bitstamp, representing a 10 percent gain on the monthly opening price of $3,434, according to CoinDesk Bitcoin Price Index. Had BTC remained bid at highs above $4,100 seen over the weekend, the monthly gain would have been close to 20 percent. Nevertheless, a 10 percent rise – assuming prices stay at $3,800 till UTC close tomorrow – will be the first positive monthly performance since July. Prices dropped 9, 6, 4.4, 37, 7 and 7.5 percent, respectively, in the previous six months, the longest stretch of monthly losses on record. Notably, November’s double-digit drop did the most damage, with prices tumbling below the long-held support of $6,000 and dashing hopes of a long-term bullish reversal from that level. The sell-off, however, ran out of steam near $3,300 in the last two months, allowing BTC to post a notable bounce in the historically positive month of February. More importantly, as we enter the final month of the first quarter, signs of bearish exhaustion have emerged on longer duration charts, as discussed earlier this week. BTC, therefore, could remain better bid in March – a weak month for the leading cryptocurrency since 2014. A green candle has appeared on the monthly chart after six months in the red. The trend, however, is still to the downside, as indicated by the downward sloping 5- and 10-month moving averages (MAs). A break above the descending trendline connecting the December 2017 and November 2018 highs is needed to invalidate the bearish view. On the above chart, the 50-week MA has dropped below the 100-week MA for the first time since early 2015. That long-term bearish crossover is widely considered a lagging indicator. Further, historical data shows the previous bear market ended with the bear cross of the same two averages. Further, the cryptocurrency created an inverted bullish hammer last week, validating the seller exhaustion signaled by the long-term MA crossover. BTC, therefore, may remain on the offensive next month. BTC created a bearish outside reversal (engulfing) candle yesterday, countering the bullish outside reversal created in three days to Feb. 8. A bullish-to-bearish reversal, however, would be confirmed only if BTC finds acceptance under $3,714. That looks unlikely, as the 10-candle MA, currently placed just below $3,700, is trending north and could recharge engines for a re-test of $4,000. Crypto exchange Coinbase is launching support for XRP, the third-largest cryptocurrency by market capitalization. The exchange announced Monday it would be listing XRP on its professional trading platform, Coinbase Pro, in “transfer-only” mode, meaning customers can only deposit tokens to begin with. After a minimum of 12 hours, the company plans to activate other trading services, though this timeline is variable. Initially, Coinbase Pro customers in the U.S. (excluding New York state), the UK, some EU nations, Canada, Singapore and Australia will be able to access XRP, with support for other jurisdictions possibly being added in the future. While no firm timeline for launching support on Coinbase’s retail platforms (coinbase.com, as well as its Android and iOS apps) was given, the exchange typically launches cryptocurrencies for its non-professional users within a few weeks of launching support on Coinbase Pro. An individual familiar with Coinbase’s internal decision-making process said the company “is prepared to support the asset however it’s classified by regulators,” referring to the open question of whether XRP qualifies as a security. Ripple Labs, its subsidiary XRP II and a number of individuals affiliated with the XRP cryptocurrency are currently defendants in a federal class-action lawsuit alleging that XRP is a security issued by the payments startup, a claim that Ripple has denied. Bitcoin’s price climbed back above $4,000 on Saturday for the first time in over two months as the broader cryptocurrency market flashed green. At 18:00 UTC on Saturday, the world’s largest cryptocurrency by market capitalization surpassed the $4,000 mark to ultimately reach $4,146 – its highest price since Dec. 24 of last year, according to pricing data from CoinDesk. 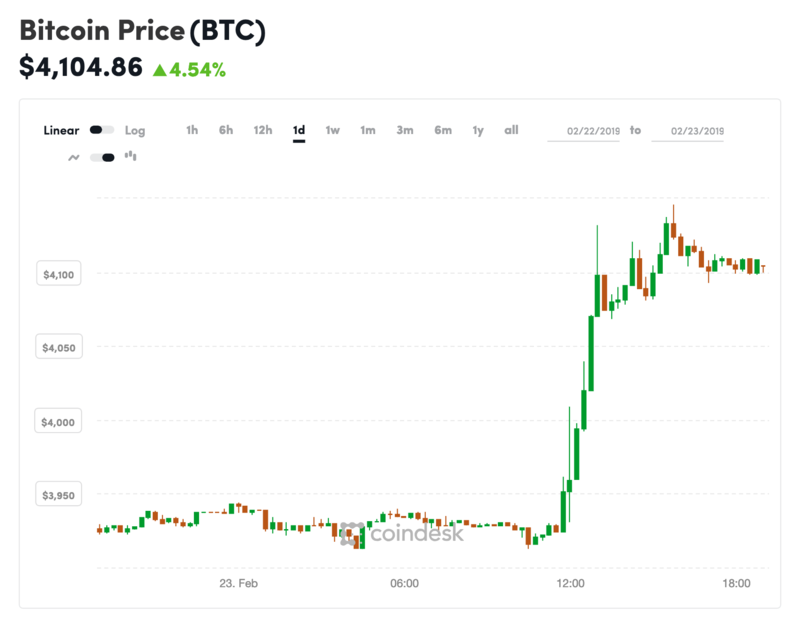 Bitcoin’s price has since pulled back slightly, now trading at $4,104, but current figures still represent a considerable 20 percent increase since the beginning of the month. Bitcoin is usually accompanied by the broader cryptocurrency market when its picks up a strong bid and the developments on Saturday were no exception. As a result, many other well known cryptocurrencies we able to record notable gains. Names like NEO, QTUM, and NEM have all appreciated more than 9 percent in the past 24-hours. Meanwhile, lesser known cryptocurrencies out of the world’s 100 largest are flashing even more impressive price growth, including NEXO and S4FE (S4F), who are up 24 and 78 percent at press time, according to data from Coinmarketcap. The capitalization of the entire cryptocurrency market has increased 16 percent over the past seven days to reach it highest value in over eight weeks of $141 billion. Also of note, the global weekly cryptocurrency trading volume is currently registering $176 billion, which is its most in a single week since the first week in May of 2018, Coinmarketcap data further reveals. A new startup called CasperLabs has launched with the aim of building a new blockchain based on a version of proof-of-stake (PoS), the experimental consensus protocol most associated with ethereum. Zamfir further told CoinDesk he would be tasked with “producing protocol specifications” in his new role that would “support the [CasperLabs] team” in understanding the eventual technology created. Zamfir will not be coding the blockchain itself, and will be helping strictly as a researcher. One of a wide array of cryptocurrency consensus models designed to validate transactions without relying on proof-of-work mining (in which users solve computationally-intensive puzzles in order to append new blocks to the blockchain), PoS has arguably yet to see significant large-scale testing. Within PoS, there are even competing designs for how to implement the idea, but the one designed by Zamfir in the early days of ethereum is called Casper Correct by Construction (CBC). Zamfir also spoke during the event today in New York commemorating the launch of the startup, alongside CEO of CasperLabs Medha Parlikar and lead developer Michael Birch. While he did not address his involvement in the project directly, Zamfir spoke heavily about his research on the process of sharding – that is breaking up a distributed system into multiple different parts – in the context of a Casper CBC framework. Casper CBC was developed in parallel with Casper the Friendly Finality Gadget (FFG) – which was created by founder of ethereum Vitalik Buterin and researcher Virgil Griffith. The two distinct PoS models draw heavily on much of the same pioneering research to do with validator reward staking and slashing conditions. While both Casper CBC and FFG were discussed within the context of the roadmap for the ethereum blockchain, the broader community deemed Casper CBC a less production-ready version of PoS back in 2017 that could stand to wait until Casper FFG is fully implemented on ethereum. Now, as development for Casper FFG continues on the ethereum blockchain, Zamfir will also be extending his research on Casper CBC, providing key analysis and review on various aspects of the CBC model including economics modalities, key parameters for configuration and more. CasperLabs is fully funded by parent company Adaptive Holdings, which is headed by CEO Mrinal Manohar. As stated in a report about CasperLabs by crypto publication TheBlock, the startup has already received up to $20 million in verbal commitments by deep-pocketed investors such as the Galaxy and BlockTower. The company has yet to confirm any details about its funding. Wladimir van der Laan, the lead maintainer of bitcoin’s most widely used software, has harsh words for those engaged in an ongoing debate about whether the cryptocurrency’s finite supply will ever be increased. Despite the fact that the software is programmed to issue 21 million bitcoins, an aspect of the code that would require everyone running the bitcoin software update to change, that hasn’t stopped speculation over the years that an adjustment might be needed. Most recently, developer Matt Huong floated the idea of increasing the supply of bitcoins in circulation – very informally – just as a possible way to reduce future fees. The comments were later inflamed by a misunderstanding, sparked by a single social media post from bitcoin’s annual Satoshi Roundtable event, an invite-only conference where CEOs, socialites and developers gather and discuss the future of the cryptocurrency. Adding to the confusion, Jiang Zhuoer, CEO of bitcoin mining pool BTC.TOP, inaccurately argued on Chinese microblogging site Weibo that developers have long been planning to increase the supply. Given the nature of the debate – a key part of bitcoin’s value proposition has been derived from the fact that it’s a scarce asset – all of the incidents above have inflamed Twitter conversations. An important figure most visible to bitcoin’s open-source developer community, van der Laan leads a weekly meeting over the chat program IRC to discuss the project’s technical roadmap. Further, he and the other maintainers Jonas Schnelli and Marco Falke are the last line of defense when checking new changes added to bitcoin’s code. Still, van der Laan sees such a stance as one that advocates for diminishing not just bitcoin’s value, but one of its core features setting it apart from other digital projects. “Scarcity is not a natural thing in the digital realm. Copying is natural,” he said. As an example, he pointed to digital rights management (DRM), where companies employ technologies to try to stop users from copying digital files by adding technology to the files to track them or make the files hard to copy. But these schemes are often broken over time, giving people the ability to copy files all over again. That’s why bitcoin’s unique, he said. Bitcoins are scarce, unlike so many other digital things. That’s not to say there might not be problems with the rules bitcoin initially implemented. “One could argue [bitcoin creator] Satoshi’s initial rules are more or less arbitrary, but as they’re fixed and deterministic they’re predictable and easy to project forward and price in,” van der Laan said. In his eyes, now that the rules on issuance are here, they’re here to stay. “The challenge here is to keep scarcity, everything else is easy and automatic,” he added. But there’s another key part of this whole discussion. The key contention from Zhuoer was that bitcoin’s developers agreed to increase the supply and were making plans to, as if changing this property of bitcoin was something they could do with a snap of their fingers. Van der Laan argued that if the developers behind Bitcoin Core ever tried to push through such a thing, people shouldn’t follow them. “If the software claiming to be ‘Bitcoin Core’ ever proposes this, I’d recommend you run software without this change as it’s been compromised,” he said in his initial tweet. “The moment one team of developers becomes immune to controversy (i.e. people will even follow them unquestionably through forks, even calling those ‘upgrades’) the system is essentially centralized,” he argued, clearly alluding to other cryptocurrencies who have made sweeping changes to their code. Ethereum has gone through several hard forks over the last couple of years. And the community looks at each of them as a suite of “upgrades” for improving the technology, rather than as possible points of centralization, as Van der Laan does. Wladimir thinks bitcoin is more decentralized in this way.
" Anda akan rasakan banyak keuntungan yang akan Di dapat setiap Hari "